If you want to write a specific customization or a large new and full-featured extension on Magento 2, this book is intended for you. You must be an intermediate to professional-level developer in PHP to appreciate this book. Magento has been revealed as the best and the most popular open source e-commerce platform in the world, with about 250k+ online stores. Magento 2 is the most recent version of this awesome toolset: every new and modern development techniques are used to offer a real modular approach and powerful architecture. The book will support you in the writing of innovative and complex extensions. Starting from the beginning, we will cover how to set up a development environment that allows you to be really efficient in your functionality writing, including GIT registering and many other development tools. We then move on to provide a large overview of the best practices to scale your module in a high-load environment. After these foundations, you will see how to use test driven-development (TDD) and unit tests to handle your code. We then build a complex extension together, step by step, and internationally-ready. Next, you will find out how to protect the users&apos; data. Finally, we will take a look a publishing the extension on the new Magento Connect marketplace and how to protect your intellectual property. After you read this book, you will know everything you need to know to become an invaluable extension editor, whether it is for your customers&apos; needs or for your own requirements. 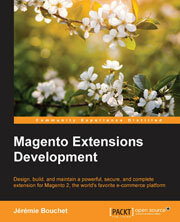 This book takes a step-by-step approach to developing the extension and learning the new concepts of developments. Each topic is explained sequentially in the process of creating the extension, and punctuated by detailed explanations of the features of the code.